It started as an armed robbery of a fast-food restaurant, but quickly went horribly wrong, and ended with two people dead, including 33-year-old LAPD Officer Zlatko Nicholai "Nick" Sintic, after a five-hour standoff. At about 5:30 a.m., three employees were opening the McDonald's restaurant at 10350 Reseda Blvd., in Northridge, just north of Devonshire Street. As they were preparing to open the restaurant, a 22-year-old man wearing a ski mask and armed with a .22-caliber pistol entered. The man had recently been released from the Colorado State Penitentiary, after serving a sentence for armed robbery. One of the restaurant employees was quickly able to trip a silent alarm, and one of the first responders was Officer Sintic, who arrived with his partner, Officer Andy Cordova, 38. Sintic was born in Zagreb, Yugoslavia (now Croatia), on Oct. 23, 1942. He came to the United States with his widowed mother, Ilonka Sintic, and younger brother, George, in November 1955. After serving four years in the U.S. Air Force, from 1962 to 1966, Sintic married Linda Kay Bridges, and the couple had two children -- Nicole, born in January 1969, and Nick, born in September 1973. 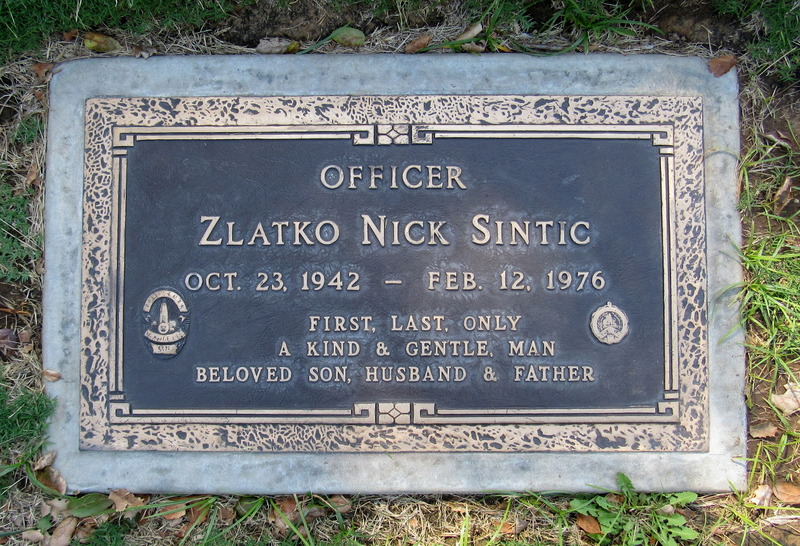 Sintic was 27 when he joined the LAPD on Sept. 8, 1969. In 1974, he was named Officer of the Year in the Devonshire Division. In December 1974, Sintic and three other LAPD officers were credited with saving two people who were trapped inside a burning house in Granada Hills. In February 1975, Sintic was on patrol when he noticed two employees of a restaurant in Mission Hills being forced by two men to carry liquor out to their car. When Sintic stopped to investigate, one of the men pointed a gun at him, and Sintic shot him. The man's gun turned out to be an air pistol, and he recovered from injuries. The two would-be robbers -- brothers from San Fernando -- were both arrested. In January 1976, Sintic and his partner at the time, Officer Gary Girard, came upon two armed men holding up a convenience store in Encino. When one of the would-be robbers quickly turned and pointed a gun at Sintic, Sintic shot him in the head, killing him. A month later, at the McDonald's on Reseda Boulevard, just a few blocks from the LAPD's Devonshire Division headquarters, Sintic and Cordova responded to the silent alarm. As Sintic attempted to enter the rear door of the restaurant, the gunman inside fired six shots, hitting Sintic five times. Sintic was able to return fire, but did not hit the gunman. Sintic was taken to Northridge Hospital, where he died during surgery. After the shooting, dozens of officers arrived and surrounded the restaurant. Two of the restaurant employees were able to escape, although one of them was injured when he was hit by police gunfire while running from the building. The gunman then took the 19-year-old assistant manager hostage in the basement of the building. LAPD SWAT officers entered the restaurant and attempted to talk to the gunman. He refused to respond, but he allowed the assistant manager to speak to the officers. He told her to tell the officers that he would not be taken alive. After nearly five hours, the hostage appeared at a side door and escaped. SWAT officers tossed two tear-gas canisters into the basement, but there was no response from the gunman. When they eventually went down the stairs to investigate, they found him dead from a self-inflicted wound, shot in the head with his .22-caliber pistol. More than 550 uniformed police officers from throughout Southern California attended Sintic's graveside service at Oakwood Memorial Park in Chatsworth. 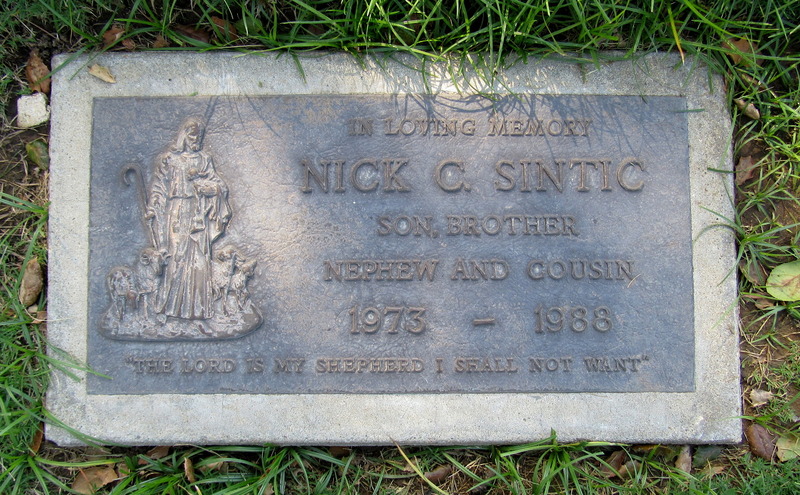 Sintic was survived by his wife; his daughter, Nicole, 7; his son, Nick, 2; his mother; and his brother. 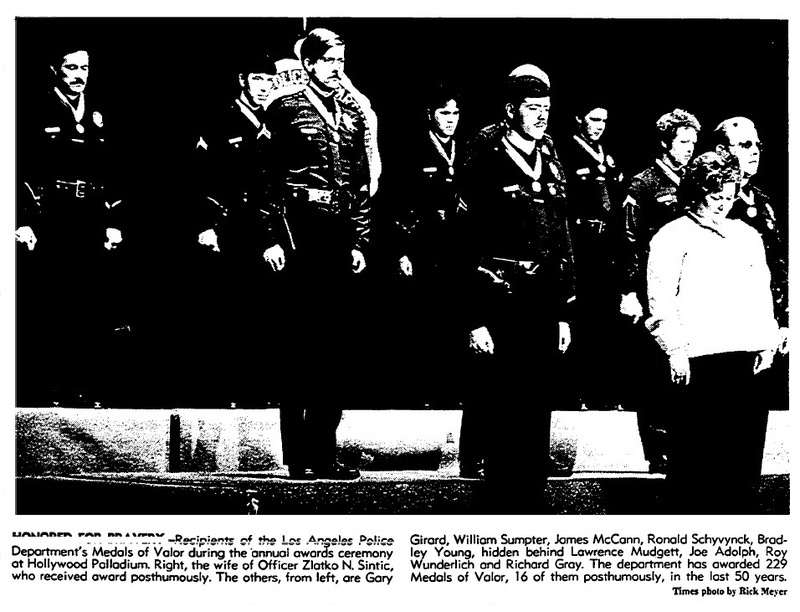 In May 1976, Sintic was posthumously awarded the LAPD's Medal of Valor, the department's highest commendation for bravery beyond the call of duty. Sintic's widow accepted the award on behalf of her husband. 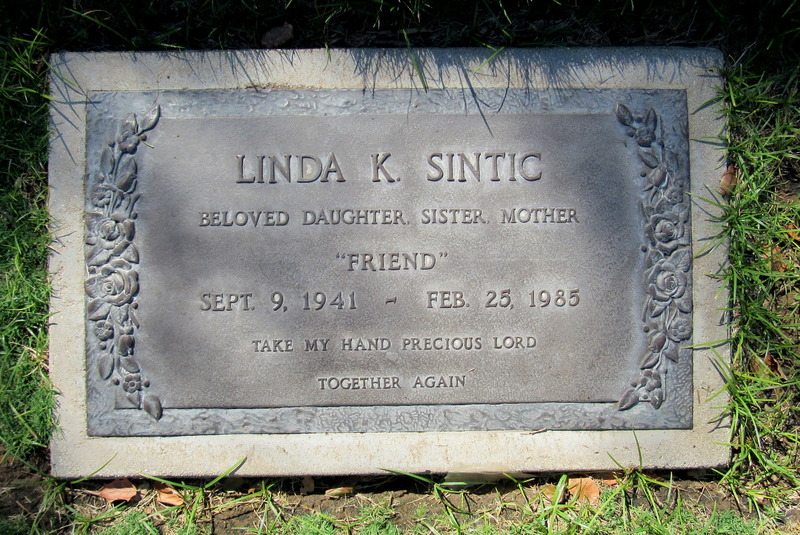 Nine years after Sintic's death, in 1985, his widow, Linda, died of cancer at the age of 43. Their son, Nick, died in 1988, at the age of 14. 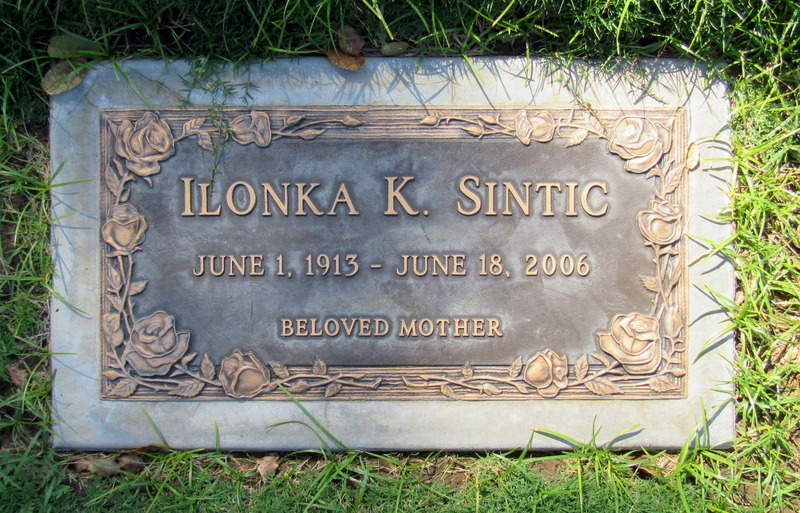 Both are buried near him at Oakwood Memorial Park, along with Sintic's mother, Ilonka, who died in 2006, at the age of 93. Officer Sintic's sign is located on the east side of Reseda Boulevard, between Devonshire and Hiawatha, in front of the McDonald's restaurant.